At Uniqlo, each employee is taking challenges and working with high aspirations in an environment where career opportunities are plentiful. All of us are committed to acting in accordance with the corporate statement, “Changing clothes. Changing conventional wisdom. Change the world.”, and work to contribute to society and the world. Each of us has a broad spectrum of career opportunities that stem from the huge potential and growth of the business. Each member of our team has opportunities to take on new challenges while constantly learning on the job. Our culture emphasizes working with integrity, respecting each individual’s work style, and evaluating fairly based on performance. We respect each employee, and encourage them to choose a work style that fits their own individual lifestyle and life stage. As a member of a diverse team, we can enhance our own skill sets and achieve results with the team. In a diverse team of individuals, we can discover and apply our strengths and build synergy while working as a single, unified team. Our people work and develop together with diverse members of our “Global One” team. As UNIQLO has established an SPA business model under which everything from planning to production and sales of clothing is conducted, categories of jobs available at UNIQLO are highly diverse in nature. Jobs introduced under each category promise a challenge as well as the ability to experience UNIQLO’s business firsthand. In our Stores, we serve as gracious hosts to each and every customer in order to provide a truly enjoyable shopping experience. What is important is hospitality. Hospitality really comes from the heart. We need your smile–a smile that brings people back to see you again. FAST RETAILING views all staff members from the same standpoint. We fairly and accurately assess the work you do, your attentiveness to others, your customer interaction, and other aspects of your performance. What is important is your motivation. It doesn’t matter whether you work part-time or full-time. Our promise to you is that the more you give, the more opportunities you will have. We are seeking individuals who constantly try to improve themselves. In Fast Retailing, we strive to be the kind of company in which every employee can grow and take pride in their achievements. We take great pleasure in helping our employees become true business managers. We aspire to be a human resource development industry. The Sales Advisors are the customer service specialist of the store. They are responsible for exceeding customer expectations by listening to customer needs, finding products that meet their needs, providing in depth product information about the goods they are interested in, providing a high level of service, and closing the sale. Passionate by fashion and customer service, they are our best brands ambassadors. The Visual Merchandiser provides solutions to store specific visual and merchandising challenges using brand standards and corporate visual guidelines to maintain brand integrity. The Visual Merchandiser adapts corporate visual direction based on individual store need and inventory levels and drives sales through strategic merchandise placement and compelling displays. UNIQLO has established a SPA (Specialty store retailer of Private label Apparel) business model encompassing all stages of the business—from design and production to final sale. By continuously refining this SPA model, UNIQLO successfully differentiates itself from other companies by developing unique products. We quickly make adjustments to production to reflect the latest sales environment and minimize store-operation costs, such as personnel costs and rent. This is how we at UNIQLO provide high-quality clothing at reasonable prices. New trends in E-Commerce and digital platforms will continue to arise. At UNIQLO, we seek to realize the world’s foremost E-Commerce business through the following initiatives while integrating our store business with digital platforms. Creating systems for sales plans and using a website as a virtual sales floor and giving rise to new and unprecedented types of online shops – using digital platforms such as UTme! and the UNIQLO app to generate customer footfall. We welcome people who wish to pursue cutting-edge E-Commerce and digital platforms, and become a leading authority in the world’s top E-Commerce business that is recognized outside of UNIQLO as well. We also welcome people who sympathize with the idea that E-Commerce will become the engine that will drive UNIQLO to become number one worldwide. Our role in Human Resources (HR) is to build and execute world-class human resource management systems that serve to underpin the growth of Fast Retailing’s business. HR functions include recruiting, overseeing employee development and promotion, and HR systems that underpin these functions; planning compensation; HR program design; store and departmental HR activities to assist organizational management, while giving attention to each employee; and managing wage and benefits programs to execute dependable HR operations. We are looking for people who are capable of going beyond addressing immediate challenges and performing their day-to-day duties and can demonstrate a flexible leadership style, in both detecting and addressing issues that are tackled by HR, as well as other departments and Fast Retailing as a whole. All this while collaborating closely with supervisors under each business and department. The Marketing function is based on a number of endeavors: highlighting product values and providing support to our merchant business, using global PR and relations with print and online media to create brand value, promoting new points of contact with customers via online tools, and producing flyers capable of generating customer footfall. In all of our activities, using products and sales floors as a starting point, we develop concepts that generate customer interest while coordinating with both internal and external parties, and promote our messages through a diverse variety of media. If you have experience in product concept development and marketing with various media such as digital, newspaper, magazine and flyer, and can sympathize with the values UNIQLO represents, then you have found the right place to work. A symbolic job category at UNIQLO, Merchandising (MD) embodies the UNIQLO business, which is founded on the principle of taking the customer into thorough consideration and addressing the important questions of what products to sell, how many and via what sales floor layout to reflect our direction of “LifeWear” and “MADE FOR ALL.” In turn, the merchandiser is responsible for planning and realizing our solutions to those questions. As a merchandiser at UNIQLO, you will create business plans and apply your decision-making capability towards seeking out the next wave of hit products, while taking into account sales figures as a reference. Fueled by a passion to have people all over the world wear our apparel, your work will place you in the role of a business leader. You will discover the essence of a merchant business that you cannot experience elsewhere. The challenge presented to you is to create apparel that will become an explosive hit worldwide and, in the process, introduce a new look for people to wear as part of their lifestyle of the future. Join us in this significant undertaking of spreading the joy of wearing our clothes. R&D (Research & Design) department currently has design offices in Tokyo, Shanghai, New York City , Los Angeles. And Paris . As a member of the UNIQLO R&D, you will be asked to focus on the creation of products, by handling a number of functions including planning, design, pattern and color determination, sewing, sample checking and fitting. In R&D, we ascertain latest fashions and lifestyles ahead of other retailers in our industry, and we link our efforts to fabric development and production, merchandising and marketing in countries where we operate to create concepts that define UNIQLO. Using such concepts as a foundation, we create products that will launch and sell worldwide. We therefore seek people who are interested to design and create clothes for all people, clothes that people all around the world can purchase easily and can be worn to reflect their individual lifestyles. We seek individuals who can champion our approach to product creation at UNIQLO as defined by a stance of zero-compromise towards quality and affordability, and that encapsulate our direction “LifeWear” and “MADE FOR ALL.“. As new stores under Fast Retailing’s flagship UNIQLO brand continue to open, the global business under our other brands continues to grow as well. Store Development could be called the foundation of that growth. This department’s duties are diverse in nature and include working together with external real estate agents, property owners and developers to realize the opening of new stores, collaborating with various departments to design stores in a manner that provides optimum shopping space to our customers, securing high-quality materials necessary for construction and operation of the best possible stores, and maintaining stores in an optimal state. Leading store creation to supply products. to a global market. Contributing directly to the expansion of Fast Retailing’s business. These are valuable opportunities you will have in this department. We welcome individuals who understand the identity of UNIQLO and can contribute to the expansion of our business while maintaining a customer-and store-centric perspective. 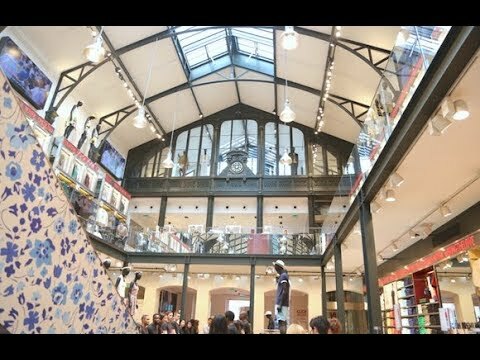 The FR Management and Innovation Center (FRMIC) is an organization unique to Fast Retailing. It is simultaneously a training organ for the development of management talent, and the starting point for Fast Retailing to promote management reforms. The development of human resources for management is akin to developing sports talent. Even with theoretical concepts and knowledge at one’s disposal, there is a need to grow by personally putting those into practice. In addition to providing all employees with opportunities to outfit themselves with theory and knowledge, we also provide them with chances to put management reforms into practice (though participation in cross-company projects). In doing so, we simultaneously promote both companywide management reforms and the growth of each individual employee as management talent. FRMIC seeks team members who have a deep understanding of management issues; advanced strategic, business-building and process-building capability for going beyond armchair theory to incorporate that understanding at the operational level; and skills conducive to implementation alongside our management. Visual Merchandising is responsible for everything that has to do with our sales floors in UNIQLO stores. We demonstrate the appeal of our products on the sales floor in a visual way, using a variety of methods. In order to realize the newest and best sales floors all over the world, VMD members are involved from the merchandise planning stage onwards and we propose product launch quantities and presentation methods. After creating styling options for mannequins, as well as store display layouts and planograms, we implement them worldwide. Our responsibility starts from the birth of our products and ends with their purchase by our customers. For new store launches, including those in new countries, VMD goes beyond borders and engages in planning sales floors, including decorations and construction with staff and colleagues from various countries. If you have an interest in fashion and are fond of styling and coordination or are experienced in spatial design or other design domains, please take this opportunity to join us and deliver new fashions and values to customers worldwide. What is the UMC program? Our Store Manager Candidate program is a year-long intensive retail master class, designed to equip you with the skills to qualify as a Store Manager on successful completion of the programme. You will be learning the Japanese standard of customer service, cleaning and professional organization. As a team player, you will be working alongside your team during morning and evening shifts, on weekends but also through holiday periods. We believe that to be an effective Store Manager, you have to start with the basics, and earn the confidence of the teams you will later go on to manage. It is not for those afraid of challenges; it is a rigorous introduction to life on the shop-floor. As a high caliber store manager, you will become a key player in Uniqlo’s European expansion; responsible for a multi-million pound/euros business unit and managing and developing a large team of people. You will also be building strong relationships with our headquarters, the “Store Support Center”, giving feedback on local marketing, merchandising, HR and E-Commerce activities. Your training needs will also be taken care of by our Fast Retailing Management and Innovation Centre, with regular classroom training to top up your knowledge and leadership skills. For the first three months you will work as a customer advisor, learning to deliver excellent customer service, and understand the basic principles at the center of Uniqlo’s mission and vision in store operations. During the following three months, you will gradually take on more managerial tasks (for example staff schedules, training plans, stock ordering, shop-floor management). Once you have mastered this, the final 6 months will see you work as an Assistant Manager, where you will be simulating the role of a store manager. However, progression within Uniqlo isn’t automatic but always based on your performances and merit. Becoming a Uniqlo Store Manager in one year is a very ambitious goal that not all of the graduates achieve; many complete the programme after 18 months, and we offer extra support to these candidates. Available vacancies for Italy are online, and we invite you to check them from the “Search a job” section of the “Apply now” page.